I wrote this post when I had approximately four readers. It still seems like a fresh and current issue to me. Betty and I collaborated again this evening; we made the “healthy” cake mix concoction where you add a can of pumpkin and none of the oil and eggs that the box calls for. This time, I tried something loosely named “Carrot Cake.” Except that the fine print under “Carrot Cake” said “with carrot flavored pieces.” This should have read, “with no carrot whatsoever,” but someone (I presume Betty herself) thought these carrot flavored pieces would be a better selling point. Damn it, Betty! Naturally, I decided to have a heart-to-heart with BC herself, so I went looking on the box for Betty. Remember how Betty has calmly walked with you through your baking-from-a-box development, shifting and changing, getting older, then younger, then older again? Just like the many collies who became Lassie for a few years, then disappeared, making room for a newer, fresher, puppier Lassie? Well, let me save you seven seconds out of your life. Betty is gone. The only humanoids on that box are a Mister Mom and Daughter on the back. Yes, they ARE wearing matching pale blue button down shirts! As if that is going to make you forget to put out an APB on Betty. 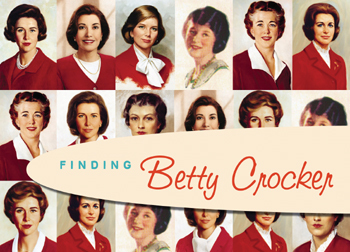 I went to bettycrocker.com, where there was a prominent feature on rhubarb (fine), but no sign of Betty, except for a teeny little tab on the left that said, “Follow Betty.” Even on Facebook, she is nothing more than a red spoon. Not even an I- don’t-have-a-profile-picture-yet silhouette. Oh, Betty. General Freaking Mills needs to be court martialed. P.S. Betty, if you are reading this, please post a photo of how you look now so that we can all make copies and paste them onto our cake mixes.